Retired Navy Operations Specialist Frederick Luhrs is pictured with William Floyd High School NJROTC cadets. The William Floyd High School National Junior Reserve Officers Training Corps recently received a generous donation from retired U.S. Navy Operations Specialist Class I, Frederick Luhrs, the father of William Floyd High School technology teacher, Fred Luhrs. Mr. Luhrs, a former William Floyd resident who currently resides in Florida, built and donated wooden naval relics that are now on display in the NJROTC classroom. Mr. Luhrs also secured and presented $1,000 in scholarships from the Disabled American Veterans for two William Floyd seniors – $500 each for NJROTC Cadet Lieutenant Commander Jordan Cooper and Mary Jones. “We are grateful to Mr. Luhrs for donating these relics to our program,” said Commander Jay Tweed (USN/Ret. ), Senior Naval Science Instructor, William Floyd High School. “His generosity means a lot to our program here at William Floyd.” Commander Tweed and the students are also thankful to Mr. Luhrs and the Disabled American Veterans for their generous scholarships. 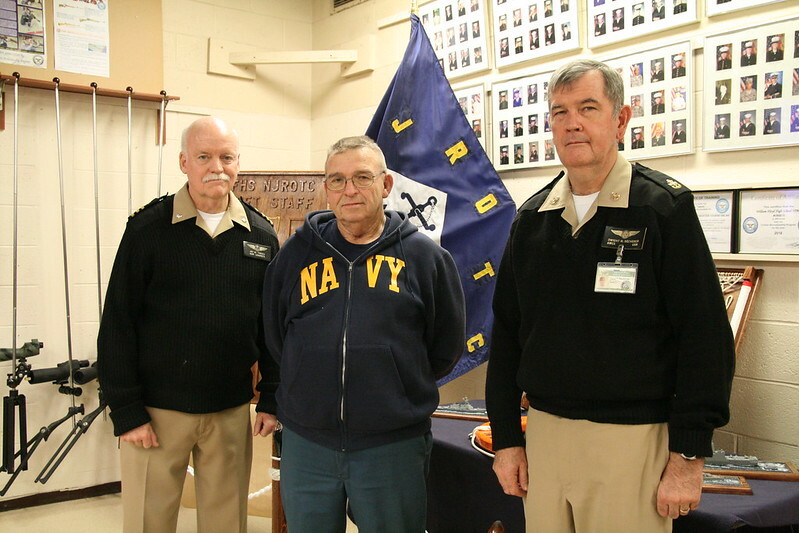 Mr. Luhrs came to the high school earlier this spring to share stories with cadets of his time in the U.S. Navy, where he faithfully served for 30 years.